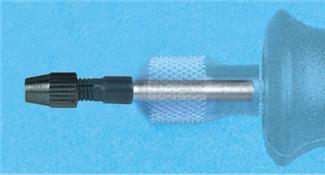 Micro Drill Chuck with 1/8 inch shank locks into the collet of any rotary tool. Will also work with hand drills and drill presses. Holds any small size drill bit from number 61 (.039 inch) to number 80 (.0135 inch). Closes to 0. Recommended for use up to 10,000 rpm only. Click the button below to add the MICRO DRILL CHUCK, #61 - #80 (1/8 " SHANK) to your wish list.